It’s not necessary to get rid of all sweets and desserts. Show kids that a small number of treats can go a long way. Use smaller bowls and plates for these foods. Have them share a candy bar or split a large cupcake. 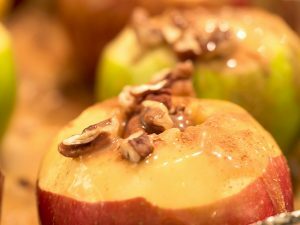 Serve baked apples, pears, or enjoy a fruit salad. Or, serve yummy frozen juice bars (100% juice) instead of high-calorie desserts. Treats are great once in a while. Just don’t make treat foods an everyday thing. Limit sweet treats to special occasions. Sugary foods that are marketed to kids are advertised as “fun foods.” Make nutritious foods fun by preparing them with your child’s help and being creative together. Create a smiley face with sliced bananas and raisins. Cut fruit into fun and easy shapes with cookie cutters. Keep in mind that candy or cookies should not replace foods that are not eaten at mealtime.